North Carolina’s Innovative School District has reached out aggressively for grant funds and partnerships, and to the community in its effort to turn Southside-Ashpole Elementary School from a failing school to a high-performing school. The Innovative School District, created in 2016 by the North Carolina General Assembly, took control of Southside-Ashpole on July 1 and will manage the school for at least the next five years. With the school year a little more than half completed, ISD Superintendent LaTeesa Allen (right) gave an update on the first takeover year. Allen was named superintendent in September, just days after the start of school. There is no hard data yet, no mid-term performance review, but the Innovative School District’s is doing all the right things, Allen said. “I don’t look at it as pressure,” Allen said. “It’s the pressure that all educators feel to succeed. Southside-Ashpole Elementary School has partnered with The University of North Carolina at Pembroke for a New Teachers Support Program, which is designed to improve beginning teacher effectiveness and teacher retention. 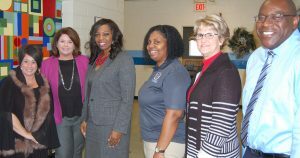 From left are Jami Graham, teacher coach, UNC Pembroke; Karen Granger, program director, UNCP; LaTeesa Allen, superintendent, Innovative School District; Tokitha Ferguson; Debbie Brown, ISD HR manager; and Bruce Major, school director, Southside-Ashpole Elementary. One immediate setback was the weeks of school lost to Hurricane Florence. Although there was insignificant damage to the school, roads were impassible and Southside uses transportation supplied by the Public Schools of Robeson County, so it waited for county schools, some of which had considerable damage, to open. Southside has an advantage over public schools. It is not bound to the school calendar. This past week, the day got even longer for some students. Southside-Ashpole joined with a handful of other schools in the Robeson Parks and Recreation grant to supply afternoon learning and enrichment. The program, funded by a 21st Century Afterschool Grant, will enroll 70 Southside students, who will be at the school until 7:30 p.m.
Southside will add more staff for the after-school program, which means more resources under the roof. Two other state Safe School Program grants have brought funding for a full-time school nurse and a full-time school resource officer. Reaching out for resources has extended all the way to higher education. A joint program involving The University of North Carolina at Pembroke and East Carolina University is supplying an instructional coach for Southside’s new teachers. 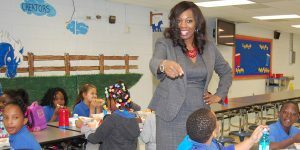 Second-grade teacher Zeinia Walker appreciates the support. “It’s really amazing, especially for first-year teachers, to have a mentor right in the building,” Walker said. Southside is no different from the public schools in that it has eight “new” teachers out of 12 classroom teachers. New is defined at the school as either first-year teachers or teachers who are teaching new grades. Because Southside is employing a new curriculum, all teachers might be classified as new. Additional consultants are coming out of Raleigh with the Leaders Building Leaders program. They will assess the school climate and work with teachers on post-instructional analysis for effective teaching. The Innovative School District and Southside-Ashpole also are building ties with the community. School leaders and staff members are building new traditions, including an open house to start school, fall and winter festivals, celebrations of Native American heritage and Black History Month, staff appreciation breakfast, and a Christmas gift drive that benefited 40 students. Perhaps, Southside’s most important partnership is with the Public Schools of Robeson County, which provides transportation, technology, school nutrition and maintenance. The Innovative School District is seeking to light a fire under a school that received another “F” on its annual grade card. They say the fire has been lit and excitement is building.